Thousands of Parisians and tourists gathered outside Notre Dame Cathedral - not to admire the architecture, as over 13 million people do every year- but to watch in horror as it burned. This morning, two thirds of the 12th century Cathedral's roof have been burnt beyond recognition. But at the same time, some of the priceless artwork inside has been saved, and authorities say the structure itself - including the famous bell towers - has largely been preserved. "I am solemnly telling you tonight: this cathedral will be rebuilt by all of us together," he said. "And it's part of France's destiny and it will be our project for the years to come. I am committed to this. Starting tomorrow, a national fundraising campaign to restore Notre Dame will be launched and this will extend beyond our borders. We will call upon the greatest talents, and there are a lot of them that will contribute, and we will rebuild. We will rebuild Notre Dame because this is what the French expect, because this is what our history deserves, because it's our profound destiny." 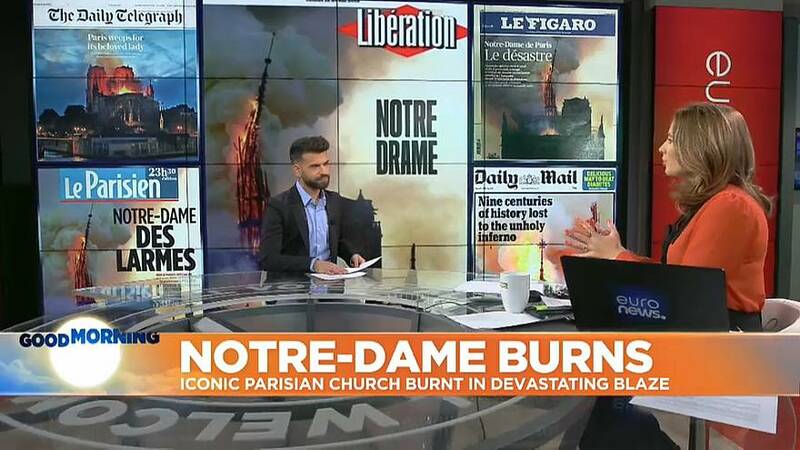 Le Parisien newspaper dubbed it, "Notre Dame des Larmes," on its front page- "Our Lady of Tears." It's a building that has been a touchstone of French culture for 850 years. "It has the same feeling, impression of something not real, something that is not," said eyewitness Dominique Bichon. "And I've been walking past the cathedral every day lately this week and it's so familiar. And now it's burned. It's upsetting, very upsetting." The crowds gathered late into the night, and ended their vigil with a rendition of Ave Maria.